Bands in red are the ones I saw at the festival, and bands in blue only have click-links to comments and homepages. ZZ Top was forced to cancel as late as May 15th and Thin Lizzy as late as May 29th. Me, my wife Anna, my cousin Lena and cousin Lars left V鋝terhaninge south of Stockholm at 5.30 am on saturday morning. Arrived at the festival at 12.56 just in time for Demon. Ran into Kenneth from Haninge in the line to get in. We met up with Lars friend Zeb down in Karlshamn. Demon, Saxon, Yngwie Malmsteen, Edguy, Bigelf, King Diamond and John Norum + Brian Robertson was best. The Demon is alive! This english hardrock band released their first album "Night Of The Demon" way back in 1981. Sadly I taped it in december that year and sold the album. They became a part of the famous NWOBHM-era and were different with a touch of direction to black metal. The difference was that they were musically competent and with a melodic touch that literally grabbed you. On the third album "The Plague", the melodies started to get the upper hand and during the nineties, they've headed towards bands like Magnum and Asia in their musical approach. Second album "The Unexpected Guest" from 1982 is my favorite of theirs together with "The Plague". This was the bands first visit to Sweden and Scandinavia. Line-up: Dave Hill (lead vocals �-), Andy Dale (bass �-), Steve Brookes (guitar �-), Ray Walmersley (guitars �-), Duncan Hanssel (keyboards �-) and John Cotterill (drums �-). Only Dave is an original member and the last three has never been on any Demon album. Encore: 2.11 p.m. - 2.22 p.m.
Appearantly Demon played two acoustic songs in the radiotent during Armored Saint, but I missed it. Guitarist Ken Ingwersen has previously recorded albums with bands like Speed and Rags, besides acting as a producer for names such as TNT, Ronnie Le Tekro and Jack In The Box. Street Legal had just released their stunning debut "Thunderdome", which definitely should be purchased and plugged to prepare for a highly exciting live-experience. Line-up: Bjorn Boge (bass, lead vocals), Ken Ingwersen (guitar) and Bjorn Olav (drums). Rather good, but the sound was way too loud for the tent. Saw Anders Alb鋍k and Stefan Johansson. American southern rockers Molly Hatchet have visited the festival in Karlshamn once before. Just like the fellows in Lynyrd Skynyrd, Molly Hatchet have since the start sharpened their axes (geddit??!!) and added more edge and attitude to their music. Once you hear their latest album "Silent Reign Of Heroes", you'll see what I mean. Bombastic guitar-riffs are mixed with groovy boogie-rhythms. Their former Sweden-debut attracted visitors all the way from Norway and the proud southern flag was seen waving in the audience and it happened again! Line-up: Bobby Ingram (lead guitars �-), Phil McCormack (lead vocals �-), Bryan Bassett (lead guitars), John Galvin (keyboards), Mike Owings (lead guitars), Andy McKinney (bass) and Sean Shannon (drums). No one from the original line-up from 1978 is still in the band. Background vocals, Pam McBeth and Beth Lockamy. Saxon was one of the bands that together with colleagues such as Iron Maiden, Judas Priest and Def Leppard started The New Wave Of British Heavy Metal in the dawn of the eighties. Singer Peter "Biff" Byford is now about as legendary as his fellow countryman Lemmy Kilminster. On the band's latest album "Metalhead" they again show they are the kings of guitardominated, power-loaded heavy metal. Fists in the air - the eagle has landed! Line-up: Biff Byford (lead vocals �-), Paul Quinn (guitar �-), Tim 'Nibbs' Carter (bass �-), Doug Scarratt (guitar �-) and Fritz Randow (drums �-). Encore: 6.40 p.m. - 7.04 p.m.
2nd Encore: 7.05 p.m. - 7.12 p.m.
Alice Cooper or Vincent Furnier, which is his real name. Alice Cooper, the band, was formed in Phoenix 1968 but they soon moved to Los Angeles where they were discovered by Frank Zappa, who released two albums through Straight Records. In 1970 Alice Cooper changed record company and got his first huge hit with "I'm 18". During the next years the band established themselves with a spectacular stageshow and a bunch of hits like "Under my wheels" and "School's out". The new album - "Brutal planet" - came out May 8th. Line-up: Alice Cooper (vocals), Eric Singer (drums), Greg Smith (bass), Pete Friesen (guitar), Ryan Roxie (guitar), Teddy Zigzag (keyboard). in 1986 when he had Ken Mary on drums (Fifth Angel, House of Lords) it was great. All the best songs and NO POP-songs. Met Ken a couple of years later as well with House of Lords. 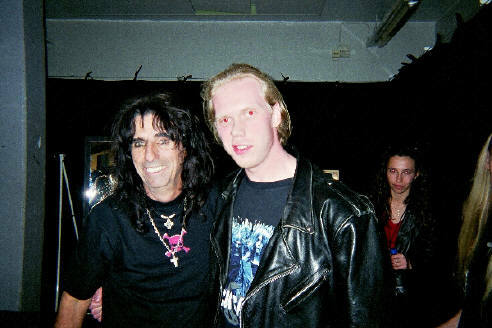 Met Alice again on April 30, 2001 at the Monsters of Millennium in Stockholm. Finally a true Swedish hero enters Sweden Rock Festival. The wishes have been many and it couldn't have come at a better time, after his best album in years, "Alchemy". On this album Yngwie decided "the hell with the complaints on the commercial gaysongs" (Yngwies own words) and so he sharpened the axe and recorded the most energized album since his debut. Yngwie Malmsteen will have Anders Johansson on drums, brother Jens will also be at the festival as a member of Stratovarius and now also Marcel Jacob (also with John Norum), which is synonymous with the backing line-up of early Rising Force. Mark Boals will handle the vocals and Mats Olausson the keyboards. German band Primal Fear is a pretty new act and recently released their second album "Jaws Of Death". Despite the band being new, there lurks a legend in the lineup. His name is Mat Sinner and he has previously released a load of albums with the band that carries his surname. Let us only point out that where Sinner produces melodic oriented hard rock, Primal Fear bursts out German metal with barb-wire guitars, pounding double bass-drums and an attitude more brutal than a Sherman tank. Line-up: Mat Sinner (bass, vocals), Ralf Scheepers (lead vocals), Stefan Leibing (guitar �-), Klaus Sperling (drums) and Henny Wolter (guitar). To a select generation of teenagers and rockers in the late '70's, Frank Marino was the ultimate guitar hero. 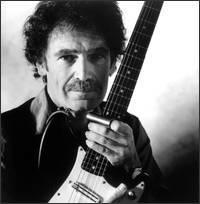 Not only did he sound incredibly similiar to the late Jimi Hendrix, but he was also the fastest guitarist around. Even after Eddie Van Halen emerged on the scene, Frank Marino remained the benchmark by which other guitarists were judged. Those who figured out how to play Van Halen's "Eruption" were cool, but anyone who could duplicate Marino's live version of "Johnny B. Goode" was considered a god. To this day, when guitarists engage in a cutting match based around that venerable Chuck Berry standard, they reach deep into Marino's bag of licks in an effort to stun their competitors. Frank released his first album in 1971 at age 16. His brother Vince came in on rhythm guitar on the 8th album. Would have liked to see more than 30 minutes but I had to go and see Edguy. German metal is nowadays a wellknown expression. This band however stands out from the rest of the Viking-look-a-likes and warrior anthems. Double bassdrums, melodic choruses and twin guitars are of course an important ingredience but in a slightly different way. They have been put away in the same category with band such as Angra and Heavens Gate, and plays more melodic metal, if you listen to "Theatre of Salvation" you will know what I'm talking about. Line-up: Tobias Sammet (all vocals, keyboards), Jens Ludwig (guitars), Dirk Sauer (guitars), Felix Bohnke (drums) and Tobias Exxel (bass). All born 1977 except Bohnke and Exxel. Met a guy from GARF after Edguy, who liked my Kansas T-shirt. "That little ol' band from Texas", is usually a phrase for ZZ Top. The description suits perfectly for another classic trio from Houston, Texas - King's X. Musically in a totally different region, but still with a faithful fanbase as "the bearded three". 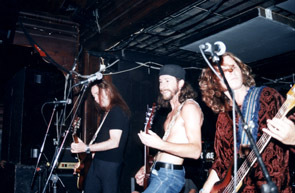 Doug, Ty and Jerry have since the debut "Out Of The Silent Planet" 1988 created their own genre, with a great number of musicians mentioning them as inspiration. Musically they're pretty difficult to place, but try to imagine the Beatles with Hendrix on leadguitar and instead of the easy popschool, they grew up at a heavymetalreformatory with Queen and Black Sabbath as rolemodels. Heavy, grinding, moody and with an inimitable feeling for harmony and style. Listen to "Dogman", "Gretchen Goes To Nebraska" or why not the latest smash record "Tape Head" and imagine a trio that sounds like a sextet on stage. King's X - Can't beat the feeling! The music was OK, but they were so boring. Didn't seem to enjoy themselves either, like Armored Saint. Met Stefan again during King's X, and met a Kansas/Rush fan in the radiotent, that didn't know that Kansas still existed. Maybe there isn't a big heavy bell in your head going off to the name Bigelf, but there should be. If you like heavy seventies groups like early Uriah Heep, Deep Purple, Black Sabbath and Lucifer's Friend, this is something you definitely shouldn't miss. Bigelf mixes crush-heavy guitars with fat Hammondorgan, Mellotron and melodic songs in a superb mix and writes songs that actually sticks when you have heard them at least once. Highlights: Closer To Doom and the Sabbath cover Sweet Leaf (but NOT because that was the only songs without Mellotron). Met Micke Runsten during Bigelf. He had gone down to see King's X and was very disappointed. Now we're talking metal legends! American metallurgists Armored Saint released their debut "March Of The Saint" on the major-label Chrysalis in 1984 (after the release of a way-making 12 inch). They wore armor on stage and were incredibly cool. After four albums singer John Bush jumped on the offer of replacing Anthrax singer Joey Belladonna and the story came to an end until 1998. Anthrax lost speed and when old Saints-men Joey Vera (later in Engine and Fates Warning) and John Bush met in a pub, they decided to bring life into the Saint again. Said and done and in the beginning of this year the amazing "Revelation" hit the stacks. Line-up: Joey Vera (bass), John Bush (vocals), Gonzo (drums), Phil Sandoval (guitar) and Jeff Duncan (guitar �-). All from the original 1983 line-up except Duncan. Had waited for them since they were one of my favorite bands back in the 80's, but they were a huge disappointment. They played no encore. Both Bush and Vera were shortcut. Bush voice didn't hold up. They got the worst audience response because they didn't seem to enjoy themselves. Met Micke Runsten, Zake and a guy that also was in Ljusdal in 1985, to see Madison with G鰎an Edman, I was there too. Also met Gunnar, Robban and Janne after Armored Saint. The "Falsetto Voice" has become a trademark for Kim Bendix Petersen, which is his real name. This new album, "House of god", is no exception. The number of high notes sung by the "king" have increased but it wasn't something that he or the band planned as they say - "The heavier the material the more screaming. The new album "House of god" has just been released. The theme on the album is a story about a man who after an encounter with a pack of wolves comes to a church and where the leading wolf turns into a woman. She is forced to guard the church after a deal she makes with the devil and has 1 year to find a replacement in order to stay alive. The main force in the band is as usual King Diamond, guitarplayer Andy LaRocque and drummer John Luke Hebert. On the new album they get help from guitarplayer Glen Drover (From Toronto, Canada) and bassplayer David Harbour. Encore: 9.03 p.m. - 9.15 p.m. Highlights: The opener Welcome Home, Abigail and Family Ghost. Those of you who have been visiting our festival previous years might remember John's heroic effort when Van Halen cancelled at the last minute. On the latest album "Slipped Into Tomorrow" you will find a highly appropriate cover of Thin Lizzy's "Killer Without A Cause", appropriate because former Thin Lizzy-guitarist Brian Robertson re-inforced the band this time around. Line-up: Singer/guitarist Leif Sundin, former Yngwie Malmsteen bassplayer Marcel Jacob and behind the drums Thomas Broman (Electric Boys/Great King Rat). Last time I saw Robbo with Lotus & Five Fifteen in Bor錽 1999. Encore: 11.09 p.m. - 11.13 p.m. Highlights: All Thin Lizzy songs (mostly Massacre though) but also Dokken's Unchain The Night. The biggest highlight was singer Leif Sundin though. He was brilliant. Five Fifteen already have four albums under their belt and is also represented on the newly released Captain Beyond- tribute. Joining them on this new album is none other than Brian Robertson (Thin Lizzy) and Nik Turner (Hawkwind) as backup, Robertson not on stage though. Five Fifteens style can be hard to describe in a few words, but maybe the album titles can point that direction, "Psychedelic Singalongs For Stadiums", "Armageddon Jam Session Number Four", "Progressive Hardrock Beyond The Mainstream" and "Six Dimensions Of The Electric Camembert". Very seventies, very psychedelic, very hardrock, very melodic, a lot to see and a lot to hear. Last time I saw Five Fifteen was in Bor錽 1999. Swedish metal lives! One proof is Gothenburg-based Evergrey, who just released their second album "Solitude Dominance Tragedy". They play wellarranged, progressive and interesting hardrock. Comparisons have been made with great bands like Savatage. The band have also left a contribution to the Yngwie Malmsteen tribute "A Guitar Odyssey", where they do their own interpretation of "Rising Force" and that graciously. "That little ol' band from Gothenburg" hardly needs no deeper introduction for you who have been to the festival before. For those of you who preferred their second album "Spanking Hour" to their latest we have happy news - they're back and they're bad (Tommy Bolin). There are people who feel that singer John Corabi and guitarist Bruce Kulick are two musicians that were "useless". John got fired from M鰐ley Cr黣 while Paul Stanley and Gene Simmons didn't have room for yet another guitarist when Kiss reunited a couple of years ago. With Union, have Corabi & Kulick, together with drummer Brent Fitz and bassist Jamie Hunting, shown that they can handle being on their own. The selftitled debutalbum from 1998 and this year's follow-up "The blue room" shows that Union are a highly potent and dynamical heavy rockband that dares to push the boundaries. There are probably one or two M鰐ley Cr黣-, Kiss-fans respectively that are gonna rise some eyebrows for Union at Sweden Rock Festival. In the new edition of Japan's largest metalmagazine Burrn! !, the readers have chosen them as follows: Best songwriter - Jesper Str鰉blad (1:st place), Best song - Embody The Invisible (6:th), Best album - Colony (7:th), Best cover - Colony (7:th) and worthy positions for them as individuals. We can recommend you to listen to them doing a very interesting and highly personal interpretation of Treat's "World Of Promises" on the anthology "Power From The North", hot from the presses. The bands live-show has earlier been risen to the sky by critics, so the expectations are high. American wacko-trio Dash Rip Rock have also played our festival and were actually meant to play last year as well. Due to a misfortune the band had to cancel. Now they are back to spread their humor-stained cowboy-punk rock and roll. Their previous visit gave a lot of people more to wish for and judging from the want-lists we have received, you do want them to come back. Your wish is our command - so here's Dash Rip Rock, by popular demand! The man with the great, big voice is back again - by popular demand! Ronnie James Dio and his own band Dio made a success at last years festival. A long tour in Sweden in the fall of 1999 together with Manowar and Mot鰎head wasn't enough. The fans wanted to see more of Dio. The band contains former Tytan- and AC/DC-drummer Simon Wright, guitarist Craig Goldie and bassplayer Jimmy Bain. The latter of the three is a familiar face from the time in Rainbow but also from the first version of Dio. Dio is also in the ropes with a new album called "Magica" which probably is the strongest album Dio has done in many years! This is a bunch of mature gentlemen with a past in rock and blues. Like a miracle they've survived both hot-rod teenagers and the hippieepoch. The distpedale is now dusted and coloures the groovy and timeless rock and their unrestrained, crazy interpretations of songs that the group performes in a raging tempo. Goda Grannar is a pronounced liveband who loves to enter a sweaty infighting with the audience. More than once, part of the audience has entered an exstatic trance. When this happened the security had to calm the people down on the dancefloor. The bands middleage has been hard to figure out but their common weight is believed to be close to a ton, but does it really matter? The main thing is that it rocks. So therefore good people, don磘 miss this happening. With a frontguy that calls himself Rock 碞 Rolf you can't possible go wrong. I'm okey with the fact that the band doesn't ring a bell with the majority of the swedish recordconsumers, but the fact is that this power metal band has rightfully earned it's cultstatus. Running Wild were recording albums when Hammerfall were still in their diapers and Gamma Ray weren't even thought of. They have never, despite all the above, performed in Sweden and considering the flow of wishes from you, the fans, it's not a minute too soon. Your wishes is our command - to a certain degree. One of the festivals strongest bluesacts is guitarist Dave Hole from Australia. Dave has shown that his remarkable slide probably causes sparks on albums like "Shoer Fuse Blues", "The Plumber", "Working Overtime", "Steel On Steel" and "Ticket To Chicago". He also showed this at last years festival, but since a whole bunch of people seemed to hear about his highly anticipated show, but unfortunately seemed to miss him, the wishes have poured in. Presumably from people that actually saw him, since the word "again" repeatedly comes with the wishes. If you like straight, forward blues, then you shall definitely not miss Dave this time. Finland has never been seen as a leading country when it comes to producing prominent heavy metal bands. One of the exceptions is however the more or less legendary Stratovarius, now with a little help from legendary Swede Jens Johansson (Yngwie Malmsteen, Dio, Blackmore's Night etc. etc.) on keyboard. The band has released numerous albums since their start in the eighties. The latest one is entitled "Chosen Ones" and is actually a best of where the tracks have been voted by the fans, except for the two previously unreleased "bonus tracks". Stratovarius delivers neo-classical German-type metal in the same vein as Hammerfall, Helloween and Gamma Ray, with the amazing fretboard-master Timo Tolkki at the helm. Fast as a shark, as Udo would have put it. On their live-album from last year "Visions Of Europe Live" they show the level of energy that exists when the band's on stage. Don't miss it for the world! Because Foghat had to cancel due to Dave "Lonesome Dave" Peveretts tragic death, we had to come up with a worthy replacement within the same genre. We would think southerners Lynyrd Skynyrd gets more than an OK in this case. Since the last visit at the festival in 1996 a few things have happened. Among others they have released the great album "Edge Of Forever", where they leave a "Money Back Guarantee" and tells us to "Get It While The Gettin's Good". So we will see them "Workin" a little "Rough Around The Edges" high steam on a "Full Moon Night", if they presumably have "Gone Fishing" in the Norje-bay. Hell Yeah! !